In the wake of the devastation of last year’s earthquake and tsunami in Japan, residents and officials of cities and towns began revisiting their emergency plans. Those in seismically active regions, in particular, revisited the expected impact of a large earthquake, not only in terms of damage that could be expected to buildings and key infrastructure components such as bridges and roadways, and extending the effect of that damage to provision of food, fuel, medical supplies, tools, emergency services and general transportation around the area. The city of Portland, Oregon, as well as citizen-led Neighborhood Emergency Teams(NET), have been including the cargo bike in their plans. 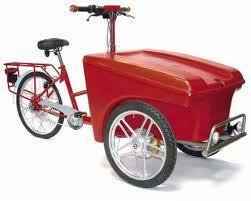 Heavier framed than the standard bicycle, the cargo, or freight, bicycle was common in dense urban environments. They were commonly used for deliveries of commodities such as milk or bread, though they were capable of carrying relatively heavy loads. According to Jonathan Maus, writing in bikeportland.org, Portland considers itself to be the most bicycle-friendly city in the United States. Though admittedly difficult to be accurate, the City of Portland estimates in its 2011 Bicycle Count Report that approximately 100,000 residents use the bicycle in their daily commute with steady growth every year in the since 2000. The city’s bicycle consciousness has led disaster planners to include cargo bicycles in the Portland Bureau of Emergency Management’s (PBEM) disaster plans. Maus reports that the city’s PBEM director, Carmen Merlo, sees the cargo bike as integral to the city’s disaster response, and will be specifically included in the Portland Plan, the comprehensive disaster response plan nearing adoption by the city council. Emergency readiness aside, there is a growing group of cargo bike enthusiasts that love cargo bikes.That are planning to put the cargo bikes to the test in an event called the Disaster Relief Trials, a cargo bike trials-type race scheduled for this June.